The minute I started it, I couldn't put it down. I tried to restrict reading to 1hr 1/2 a day because I knew once it was done, I would be sad to have to say goodbye. But now that I've finished the last page, I can't say that I'm disappointed because the story stayed true to the characters. Thank you. Perfect. I loved it. Amazing writing, it feels like I am IN the story. I love that the charactors show thier feelings through out the book. A bit of romance and a LOT of danger, I feel like it fits together. We did it! We mAde it to the end of this incredibly amazing series and what a ride it has been. I feel like part of the Rampion crew after following these stories to their thrilling conclusion. From the moment we meet the capable and brave Cinder to the introduction of the multi layered Winter, this story took every turn possible leaving me all types of anxious and bingeing until the last letter. The stories sciences the bringing highlighting each character was beautifully written and more creatively conceptualized. The tiny hints of connection between the stories and their fairytale counterparts were perfectly inserted and never stopped me from smiling at the connection. I was worried that having so mAny characters brought together from the first three books, not to mention the introduction of Jacin and Winter, would clutter the story, but again the writing is well thought out and just perfect that they all seamlessly blend together without shortening one story over the other. Perfect symmetry. If you're looking for a story that whimsical, intelligent, and creative this is the series for you no doubt about it. 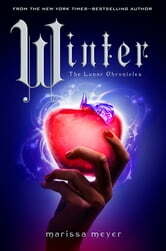 This novel was a great ending the The Lunar Chronicles. I loved meeting Princess Winter and having all the characters we have seen thus far come together. Marissa Meyer doesn not disappoint! I'm definitely glad there are another 3 books in this series, because I don't want it to end! I love the world building and adore these characters so much. The final book didn't disappoint in scale, sacrifice, and realism. The finale was shocking for many reasons, and no one walked away unscarred in various ways. The action was plentiful as the characters worked to get their revolution rising and wage their final attack on Levana. There were very tense moments, especially near the end when beloved cyborg Cinder is truly alone against her enemies. There was also plenty of emotions as true feelings are revealed, secrets are unveiled, and characters need to find their courage to face their greatest challenges and enemies. I felt the worst for Scarlet and Wolfe, who faced serious hardships that threatened to break them. That said, Cinder definitely worked her way through trial after trial after trial. As for Winter and Jacin, well, I still felt Jacin was a bit too much of a jerk most of the time, though he was definitely a cinnamon roll when it came to Winter. As for the Princess herself, I found her to be immensely fascinating. She is a character I would have loved to spend more time with. I truly, deeply enjoyed this main story arc way more than I believed I thought. I honestly never wanted it to end, and am super excited to see where the new books take it!